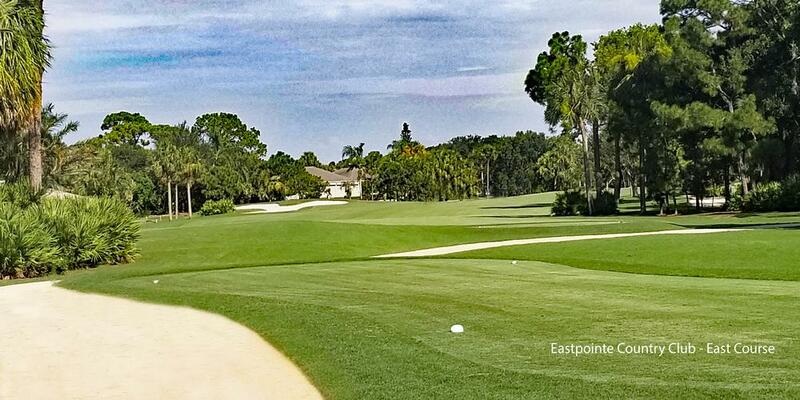 Eastpointe Country Club sits within the gated community of Eastpointe in Palm Beach Gardens, Florida. The community is located just west of Interstate 95 on the south side of Donald Ross Road and has 875 single family homes. Originally, there were two full-service country clubs within the community: Eastpointe Country Club and the Golf and Racquet Club. The two clubs merged in 2015 with Eastpointe assuming the Golf & Racquet's Club's debt. As of 2003, Eastpointe is a mandatory membership community. Homeowners are required to at least become social members. However, membership is not just limited to residents. More on that later. There are currently about 1000 total members. The golf courses at Eastpointe have been designated as a "Certified Audubon Cooperative Sanctuary" by the Audubon Cooperative Sanctuary Program for Golf Courses. They are part of a prestigious list of the world's top environmentally sensitive facilities. Even the members at Eastpointe Country Club have become involved and maintained a strong environmental policy including a tree program that receives numerous donations throughout the year. The East Course opened for play in 1974. From the back tees it plays 7011 yards with a course rating of 74.2 and a slope of 131. 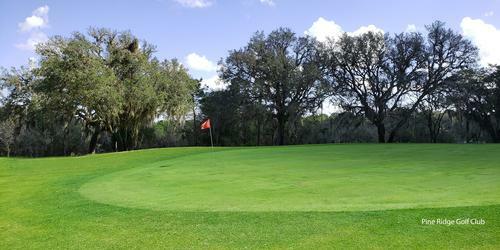 This par 72 course features wide fairways with well bunkered and challenging green complexes. 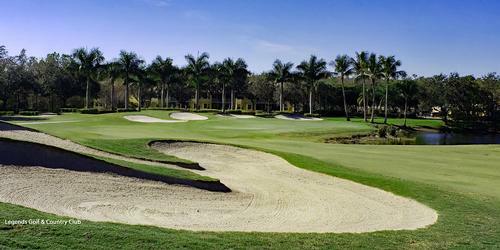 The East course is quite playable and challenges players of all skill levels. 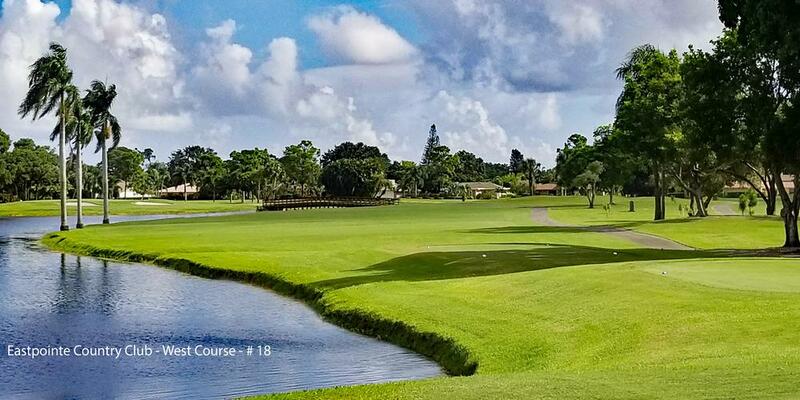 Rolling fairways, Bermuda grass greens and shimmering lakes will delight the senses and make you want to come back and play again. 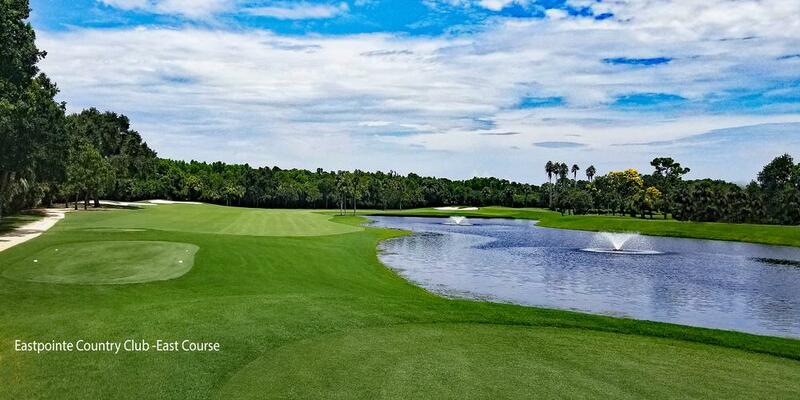 The East Course's signature hole is number 18, a daunting par 4, dogleg right that measures 463 yards from the back tees and culminates with an island green. Mere mortal men will play it from 377 yards, while most ladies will have a go at it from around 350 yards (for the ladies it's a par 5). Water down the entire right side and two strategically placed fairway bunkers on the left side off the tee put the emphasis on straight. Unless you hit a great drive, don't be ashamed to layup and go for the one-putt par. Don't be surprised to see blue herons, pelicans or even an osprey fishing in the lake - just hope they don't bring up your ball! The West Course was designed by Tom Fazio and opened for play in 1982. West offers a challenge to all levels of players. The course plays to a par 70 and is considerably shorter than its sister course, playing only 6458 yards from the back tees. Don't let the length fool you. 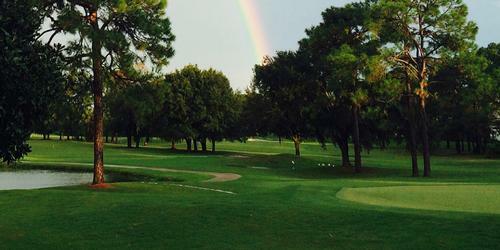 The fairways are narrow, the greens are small and well bunkered and there are numerous water hazards. The West Course presents a far different challenge than the East and demands accuracy and precision. The signature hole on the West Course is a medium length par 3 that plays 159 yards over water to a medium sized, kidney shaped green. With the water in front and bunkers front right and back left, hole 10 can be one of the most intimidating shots on the course. Par is a good score here. There are many other amenities as well. If you like to play tennis, there are 16 Har-Tru courts at Eastpointe. You'll have the opportunity to meet players of all skill levels and enjoy leisurely and competitive games with family and friends. After you heat up on the course or on the courts, cool off in the heated, 2,800 square-foot pool. Eastpointe also offers members a fitness center at each clubhouse. Each fitness center is staffed with certified personal trainers whose goal is to see to it that members attain their peak health and fitness levels. And, Eastpointe's lively social calendar and spacious card rooms help members create lasting memories. After your round, you'll probably want to unwind and rehash some of your best shots with your partners. Whether you're looking for a casual drink and quick bite or a formal sit-down meal, Eastpointe offers five dining venues for members. 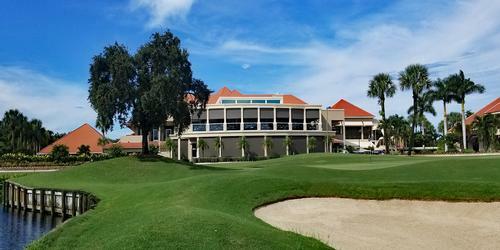 The Grille Room overlooks the 18th hole on the East Course and offers a fun and casual setting for a round of drinks or lunch after your round. The West Bar is the hub of the West Clubhouse and much like the Grille Room, offers a casual atmosphere with spectacular views. Should you find yourself poolside, you can enjoy a casual BBQ or afternoon cocktails around the pool. Each clubhouse has its own formal dining room. Eastpointe's culinary team realizes that dining is more than just a meal, it's about sharing and celebrating with family and friends. Whether you're there for Sunday Brunch, the memorable lunch buffet or one of Eastpointe's themed Friday Night Dinners, the staff will see to it that you have an enjoyable experience. Eastpointe Country Club offers several membership options for both residents and non-residents. 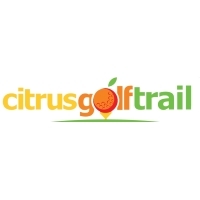 Options include Club Social and Resident Social, Full Golf and Junior Full Golf and Discovery Memberships. The latter is available to non-residents who have never been a member of Eastpointe. Discovery members have all the benefits and privileges of a full golf member, but do not have voting rights. Discovery Memberships require a 2-year commitments and are paid each year in four installments (September - December).